I went to the Arts Midwest conference last week and I am still sorting out all the notes and brochures, etc that I picked up. There were a couple general bits of observations I wanted to share. Blake Potthoff, Executive Director of the Fairmont Opera House in Fairmont, MN gave me permission to share something he said in one of the professional development sessions. He opened his comments by expressing a problem totally opposite of the one the rest of us face–he wanted advice attracting older generation audiences to his shows, specifically those from Generation X. Apparently he isn’t having problems attracting millennials. Later, he mentioned that one of the ways they evaluate how their shows were being received was by convening an advisory group every other month and asking them whether they felt a show in the season had been programmed for impact or for dollars. In other words, once people have seen the show, the organization asks their advisory group if they felt the inclusion of the show in the season had been purely motivated by money or if they felt the show had been meant to have some impact on their lives. 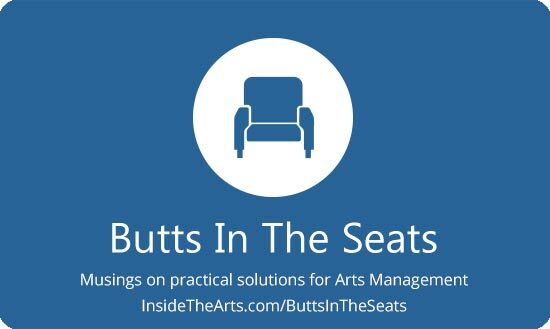 What didn’t come up in the professional development discussion was the fact that the arts org can often lose more money on what people perceive to be a cash cow than on a lightly attended event. Potthoff said these discussions have really impacted how the organization plans their season and experiences. The approach was pretty intriguing for me. This isn’t a question we generally ask our audiences. Usually, the rule is not to ask a question if you don’t intend to act on the answer. In this case, I am not sure what my response would be to the answers I would get. If my goal is to have an impact on people’s lives, does it matter if people think a show has a commercial motivation and turn out in sufficient numbers to support it? If people answer that a show was impactful, but too few people show up to make it financially viable –well this situation is what we generally assume. Things that aren’t popular are still worth doing for the impact. If people feel a show was both motivated by commercial success and feel the show was highly impactful for them, that might provide some direction, especially if I felt the show was mostly feel good fluff without much value. I just have to put my snobbery aside a little and explore what contributed to people feeling this way. Then there is the final option where none of our expectations are met – what we intend to be impactful is viewed as commercial and what is intended to be a money maker is viewed as impactful. Some answers may lead you to place where you resent your audience for being out of tune with your intent. In some respects, this may be a question that you ask not knowing exactly what you will do with the answer–except that you resolve to be open minded and not reflexively decide the answers are irrelevant. Because you probably also need to ask, does your community care whether something is meant to be a money maker or impactful? Do they have negative associations with their concept of what the intent to make money entails? When they perceive something was intended to be impactful, do they feel that it has improved their lives or that they viewed it like vegetables–they know they are supposed to consume it for its cultural value, but they really prefer something else. Even beyond the question of profit vs. impact, it may be enlightening to generally ask people what they perceive our organizational motivations to be. Show Of Hands- Conference Professional Development Sessions Mostly BS Or Sources of Valuable Info?